The Atacama Evoque Eco 60-40 modular support features 40mm Carbonised Bamboo shelves with a choice of three interchangeable leg heights capable of supporting equipment up to 30kg per level. The black high gloss legs are equipped with A.S.I.S.T (Atacama Sonic Isolation System Technology) in the form of dampening gaskets and aerospace grade isolation components matched to full adjustable nickel plated 8mm steel spikes. These components are designed to dampen then channel high frequency resonance reflection away from the shelves allowing supported AV components to deliver maximum performance. PLEASE NOTE- As well as the 145mm, 195mm and 245mm standard shelf heights, a seperate 300mm leg only accessory pack can be purchased seperately. 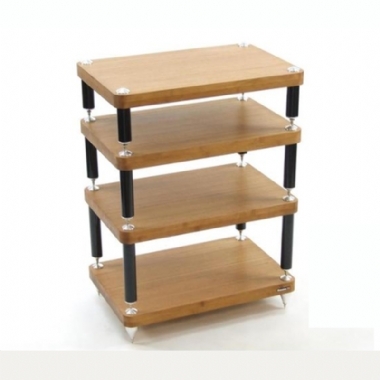 This leg pack is interchangable with ANY of the standard height shelf modules. Please contact us for more details regarding this pack or any other variant you would like. Atacama high density carbonised bamboo gives significant major sonic qualities when compared to traditional hardwood and veneered supports, with its unique micro growth pore structure offering both vibration absorbing and sound dampening properties. Each Bamboo module is cut, finished and then polished by hand at the UK based Atacama factory so giving a stylish, modern appearance. Please note:- Bamboo is a natural material so colour, texture, grain and age may give a variable appearance to each shelf. Because of this, adding an extra shelf at a later date will introduce a batch / colour tonal difference. Where possible order your Evoque as a complete modular support with enough levels to fulfil possible future requirements in order to minimize this variation. There may be some darkening of the Bamboo over time. This is normal and part of the wood maturing process. Evoque ECO is made in the UK.